This Book Is Finally Out!!!! Let me know how much you enjoyed it ! For all those who choose to live “imperfectly” with the messy things they love, this book shows how to do so creatively, happily, and with considerable style ideas from leading designers. 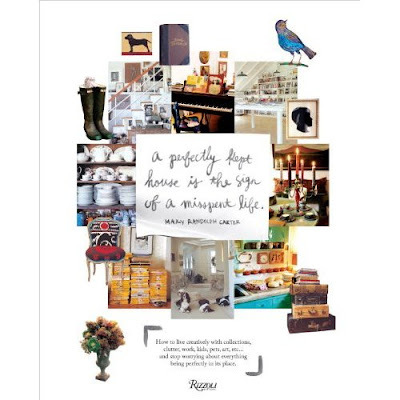 A beautiful and inspiring volume, A Perfectly Kept House Is the Sign of a Misspent Life focuses on living well with everything that makes a house a home. If you have been influenced by the picturesquely cluttered studios of Pablo Picasso or Alexander Calder, or by the art- and book-filled house of Vanessa Bell, this unique style book will stimulate you with its creative ideas.This volume explores how real-life tastemakers (photographers, textile designers, fashion designers, writers, artists) integrate their life and interiors to live well with their passions, histories, conveniences, and inconveniences. In inspiring essays, Mary Randolph Carter muses on such key housekeeping concerns as clutter versus mess; open windows; and unmade beds. Combining practical tips with liberating philosophy—”Don’t scrub the soul out of your home”; “Make room for what you love”—this volume celebrates living beautifully and happily, not messily. Lavishly illustrated with intimate photographs of different living spaces, Carter exalts in the beauty of imperfection and in living perfectly in our “imperfect” homes. Life isn’t perfect—why should your house be?